Workers repair a roof with hurricane damage. BASSETERRE, St. Kitts –- More than 900 families received hurricane relief assistance from the Team Unity Government’s Hurricane Relief Fund (HRF) for damage to their homes done by Hurricanes Irma and Maria. An update on the success of the programme was given by Prime Minister Dr. the Honourable Timothy Harris at his press conference on Thursday, Aug. 30. The prime minister indicated that so far $11.5 million was spent on house rehabilitation and according to Dr. Harris, citizens and residents were appreciative of the support provided by the government. Dr. Harris further lamented the disloyalty of the Opposition Leader who sought to undermine the Hurricane Relief Fund, which has been doing so much good for the people. 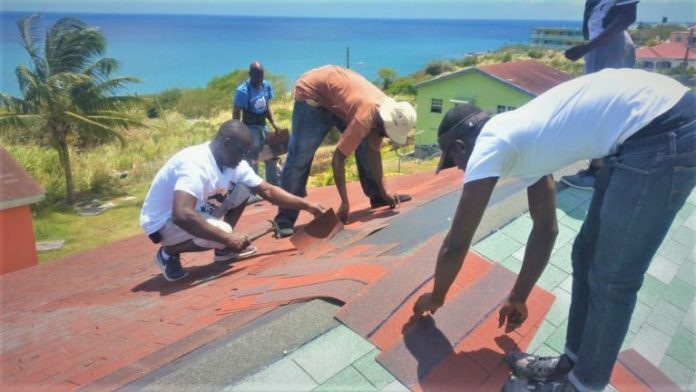 “The irony of the criticism from the Leader of the Opposition is that had it not been for the Hurricane Relief Fund many in his constituency and the country at-large would still have tarpaulins on their roofs going into yet another hurricane season,” Prime Minister Harris said. • 93 individuals who benefitted through mortgage loans from 2015 to 2018 from the FREESH and GRASP programmes at National Bank.